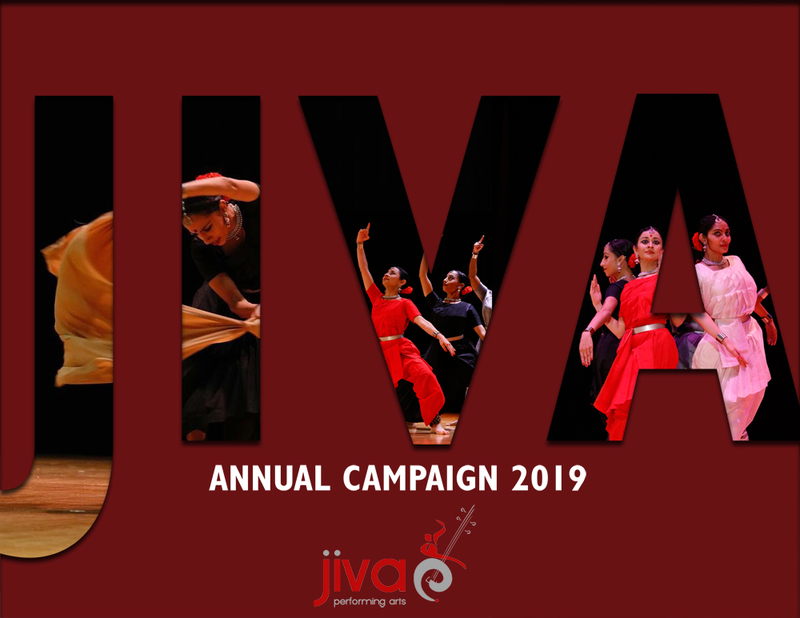 Will You consider Supporting Jiva into 2019? Jiva has become a proven leader in the preservation and promotion of the classical arts of India in the US, and your continued support is needed now more than ever to help us continue our work. This year, Jiva is not hosting an annual Gala, but relying on our annual campaign and donations from supporters like you to continue our work. We are hoping to raise a much needed $35,000 by Dec. 31, 2018 to help support our programming costs. Please consider and help shape the future of Indian classical dance in NYC. If you would like to donate, please click this link here . Jiva has proven itself to be one of the leading Indian classical arts organizations in the area. We have received considerable recognition not only in the New York Times, but has also been recognized as a growing leader in the arts: among many accomplishments, Jiva was invited to bring classical Indian dance to the Joffrey Ballet School for the first time in its 62-year history, the first Indian dance company to be awarded the CUNY Dance Initiative residency where Jiva dance has developed its new work, recording Bharatanatyam lessons for Juilliard’s new online educational programs, and receiving the inaugural Dance/NYC Dance Advancement Fund as well as grants from the NYC Dept. of Cultural Affairs. In the past year alone, Jiva has presented at some very major venues including the 92STY, Symphony Space, Queens College, Gibney Dance and St. Lawrence University. Our work has been featured by NBC Universal, and Jiva Dance’s first dance film short was an official selection at the NY Indian Film Festival. Jiva has presented master artists from India as well as Grammy-award winning musician Glen Velez. Jiva has presented intimate concerts as its signature Solo Studio showcase, the abhinaya baithak and the chamber music series throughout the NYC area, supporting professional local artists and students. All of this was in large part due to your continued support. Our appeal is vital - In the arts economy that we live in, recognition and achievement does not bring with it the support Jiva needs to sustain its everyday creative and operational needs, as well as its growing educational programming. Jiva has received more and more support from foundations and government grant-agencies. Yet these grants – as is often the case – only fund a small percentage of these projects and operations. It is your tax-deductible contribution that makes our programming possible, and helps us further our mission and goals. Please see the pie charts below which demonstrates how your donations have supported tour work in the last fiscal year. We thank you for supporting Jiva, and we look forward to seeing you at future events! 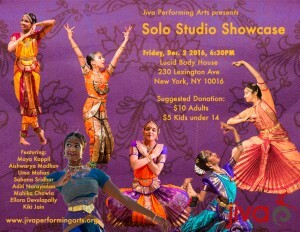 Jiva Performing Arts presents its first ever evening of solo showcases! This evening features our dancers presenting classical pieces in an intimate studio setting. 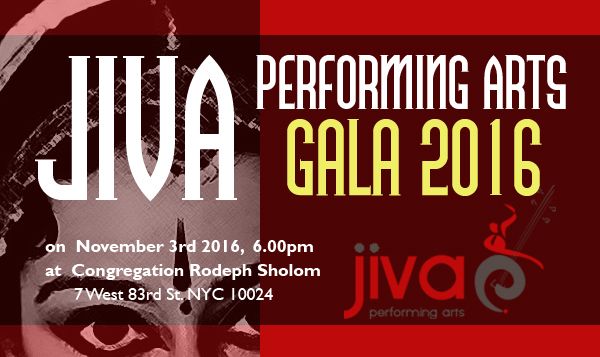 The Board and Patrons of Jiva Performing Arts invite you to our fourth annual gala! 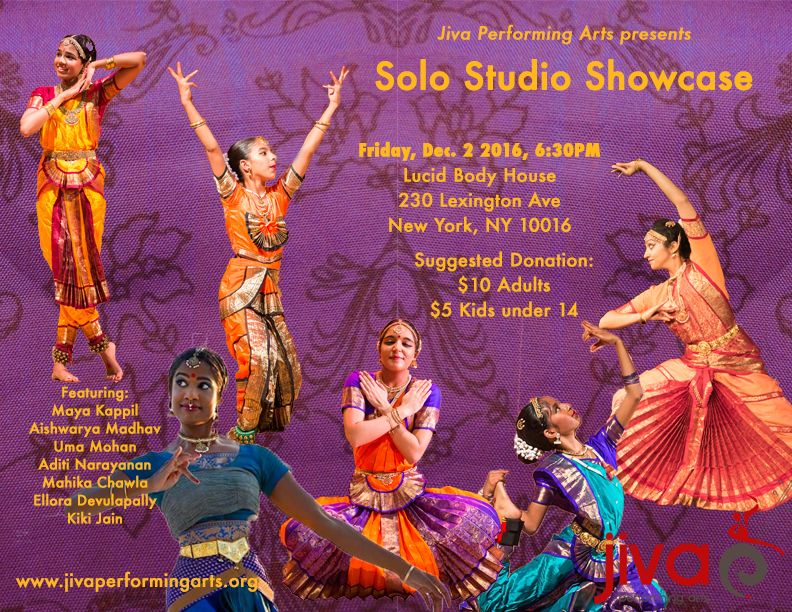 Jiva's fourth annual gala celebrates another year of excellence in Indian classical dance programming and pedagogy. Join us for exclusive performances, fine Indian cuisine, drinks, and dancing, as we share our plans for the exciting future of Indian classical arts in New York City. Funds raised from this event benefit Jiva's ongoing efforts in dance education, financing new instructional videos, master classes, assistant teacher training and salary, a travel fund for intensive study in India, our beloved Vidyanjali student showcase, and much more! Keynote speaker Laveen Naidu began studying ballet in his native Cape Town, South Africa, and went on to earn a scholarship from the Dance Theater of Harlem in 1992. After many years of international touring, he became the executive director of the Dance Theater of Harlem. Under Naidu's leadership, the company flourished and grew after a long hiatus and collaborated with national arts institutions like The Kennedy Center. He is currently Artistic Director of BalletNova in Falls Church, VA.
Sonali Mishra began her training in the Odissi dance tradition under Smt. Chitralekha, Smt. Ellora, and Sri Devraj Patnaik in Toronto. Since 1995, she has been travelling regularly to Orissa, India for further study and refinement. Sonali has performed as a soloist and has given masterclasses and lecture-demonstrations to dance students and lovers throughout the US, Canada, India, the UK, and Malaysia to widespread acclaim. Jiva Dance is Jiva's resident performing company. Led by Jiva Artistic Director and choreographer Sonali Skandan, Jiva Dance performs original classical choreography in the Bharatanatyam style and has received widespread acclaim for their efforts in performance and education. 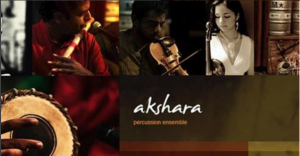 Akshara is a New York-based ensemble led by composer, mridangist, and educator Bala Skandan. Blending Carnatic, Hindustani, and World music traditions, Akshara collaborates extensively with Jiva Dance, and recently recorded their debut album. The ensemble also features MaxZT, Arun Ramamurthy, Jay Gandhi, and Kabilan Jeganathan. 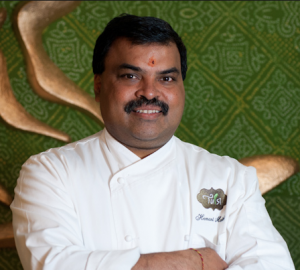 Michelin Star chef Hemant Mathur is the prolific restaurateur behind many of New York City's biggest names in fine Indian cuisine like Tulsi, Devi, and Tamarind, as well as many up-and-coming eateries like Kurry Qulture in Astoria, Queens, focused on regional and seasonal Indian cuisines. DJ Sunny and MC Pervez are sought-after local entertainers and facilitators for events in the South Asian communities of New York City and beyond. Their high energy, charisma, and extravagant light shows make them highly in demand for weddings, corporate events, and more. We hope you will join us for a fantastic evening! Purchase tickets here. Jiva is delighted to announce a free public performance as part of Madison Square Park’s “Kids Fest: Stages in the Square” on October 15. Jiva Dance and students will present their work to live musical accompaniment as part of this family-friendly event, which features a diverse selection of performers from around the city on three stages. Jiva’s performance will close out The afternoon-long event , which runs from 11am until 3pm. We hope you will join us for a beautiful outdoor performance! 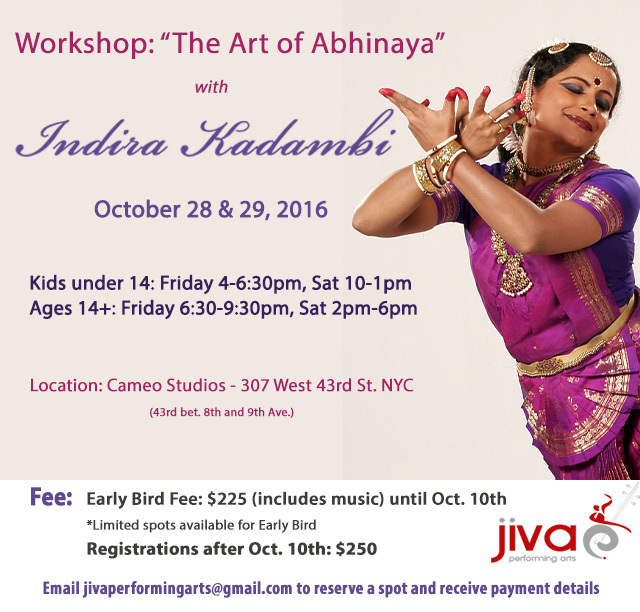 Madison Square Park - 11 Madison Ave.
Join us for a weekend-long Abhinaya (art of expression) workshop for kids and adults. The workshop is conducted by Indira Kadambi, a highly talented and much sought after teacher in the art of Abhinaya. Indira Kadambi is one of the foremost and outstanding exponents of Bharatanatyam today. She is one of the most sought after Abhinaya teacher today. Her works are traditional, yet contemporary, and she has traveled all over the word performing and teaching. In 1987, Along with her husband T.V. Ramprasadh, a well known Carnatic classical vocalist, Indira Kadambi established Ambalam, Centre for Performing Arts. In 2012, eAmbalam launched the world’s first Online College of Indian Performing Arts offering Diploma and short term certificate courses in Bharathanatyam & Carnatic vocal integrated with Yoga along with SaMaaGaMa, a vibrant, interactive, community portal for artists and art connoisseurs worldwide. Special Early Bird Pricing until 10/10/16: $225 including music! limited spots are available for Early Bird. After 10/10, workshop fee is $250. Please email jivaperformingarts@gmail.com and follow this ticketing link to reserve a spot in class! Reservations are not confirmed until payment is received. This workshop is co-organized by Jiva Performing Arts and Kumari Mayshark Patel. Though classes are run by the session, students are permitted to take 1 paid trial class. The fee will depend on the class level. Do I have to register for the full session? Yes, we do not offer walk in classes, as classes are taught in a progressive manner. I have studied Bharatanatyam before, do I need to start in the Beginner group? The level for all new students will be determined by the teacher. In some cases, if the style is vastly different, the student will be asked to join the beginner group to refresh adavus and foundational steps. All classes do begin with a warm up with adavu practice regardless of level. Will I get performance opportunities? Every Spring, Jiva presents Vidyanjali, which features the talents and achievements of students at all levels. Vidyanjali provides an opportunity for students to experience dancing with live orchestral accompaniment, a very unique and special experience for all students. The show is funded every year through tickets sales by all the students and our patrons. In some cases, students would have to purchase/rent Bharatanatyam costumes and jewelry for the performance. More experienced students will get opportunities to perform at various events and festivals throughout the year as well. What is the dress code for class? Students are asked to wear cotton salwar kameez and dupatta. If students do not have a set, they can wear loose fitting t-shirts and gym pants in the interim. Older students may be asked to wear a dance practice sari. What materials do I need to bring to class? Students should bring a notebook, the theory notes and practice log which will be emailed to them and a pen. Ramya Narayanan is Vice President and General Manager Credit Card Product Management at American Express OPEN. OPEN is American Express’s business unit dedicated exclusively to supporting small business owners and is the leading card issuer to this segment. Ramya assumed this position in April 2012 and is responsible for development and marketing of OPEN’s Proprietary Lending credit cards as well as Co-Brand credit cards (Delta, Starwood, Costco and Lowe’s). 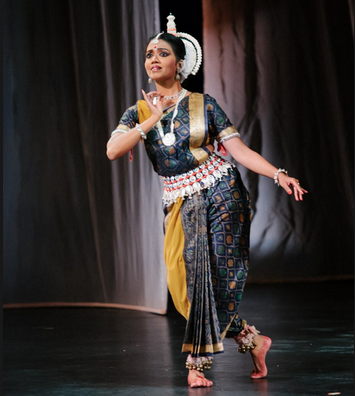 Ramya is on the board of Jiva Performing Arts, a NYC-based Indian classical dance (Bharatanatyam) and Carnatic music organization. Ramya has an MBA from Cornell University, a MS in Industrial Engineering from University of Wisconsin-Madison and a BE in Industrial Engineering from Anna University, Chennai, India. She lives in New York City with her husband and two children. 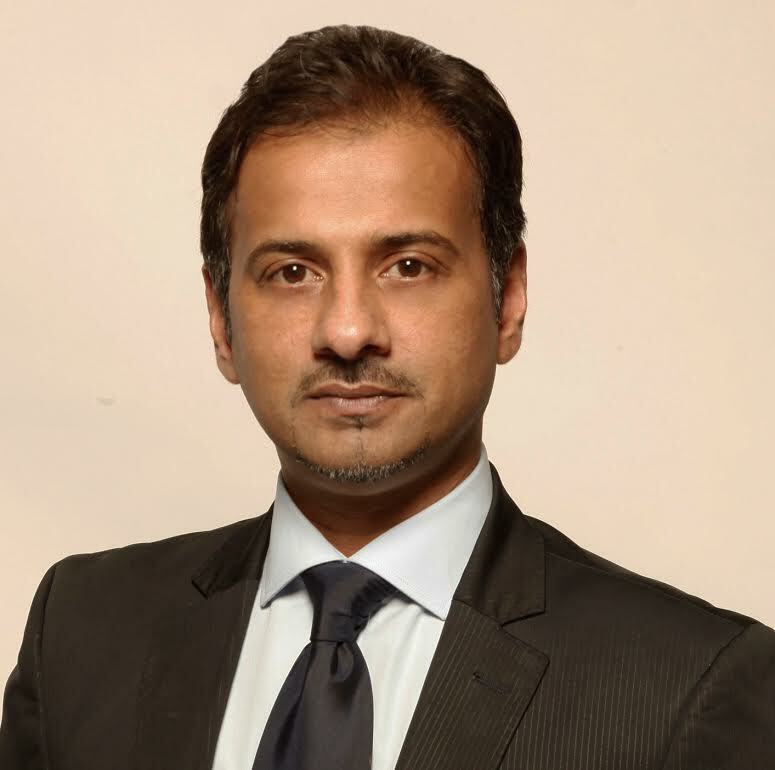 Giri Devulapally, CFA, is a portfolio manager at J.P. Morgan Asset Management where he is responsible for managing the large cap growth portfolio. Previously, he has worked for T. Rowe Price for six years, where he was an analyst specializing in technology and telecommunications. Giri received his M.B.A. in Finance at the Booth School of Business at the University of Chicago.